That monumental sweet sixteen only comes around once, and it’s a milestone to CELEBRATE! I always look forward to hearing about the different types of parties or events that teens are doing (or that their parents are surprising them with), and I get a little giddy when it’s something extra fun or unique! This gorgeous girl wanted to make her love of the Rangers the highlight of her birthday, even though her family is comprised of mainly Islander fans! Isn’t that hilarious? 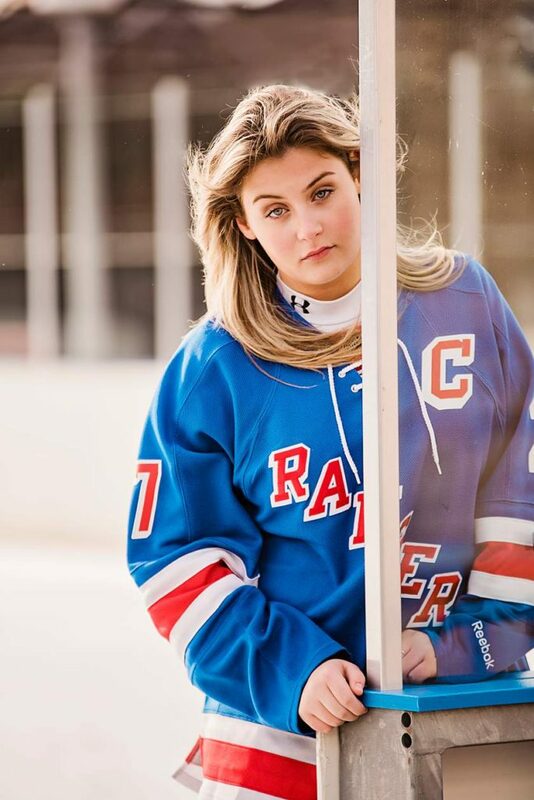 For her sweet sixteen, she will be celebrating at the infamous Madison Square Garden during a Ranger’s Game, so we wanted to capture that same energy and fun in her birthday shoot. We couldn’t book out the Garden (ha! ), but we were able to secure our local ice rink, and this lovely lady had so many exciting ideas to try, including that crazy cool ice spray! Of course, she was decked out in her favorite Ranger’s gear, and looking stunning in every piece. If you or someone you love is celebrating that amazing sweet sixteen, let me know what kind of theme you might be dreaming up. Nothing is too crazy or “out there” to try, and I am always up to help design or style a themed shoot for you or your teen. I hope this amazing girl has the best birthday ever!